To have or not have sweets, is a common conundrum witnessed in almost all households, at least occasionally. While their allure is known to break the most rigid diet regimes, it is in fact obvious that too much sugar is harmful for health. Only if there was a way to have sweets and avoid all the health risks! What if we tell you that there is a way? Palm jaggery, made from sugarcane juice and the extract of palm tree, is a must keep in your kitchen cabinet if you want to have your heart’s fill of the sweets and avoid all the health risks. 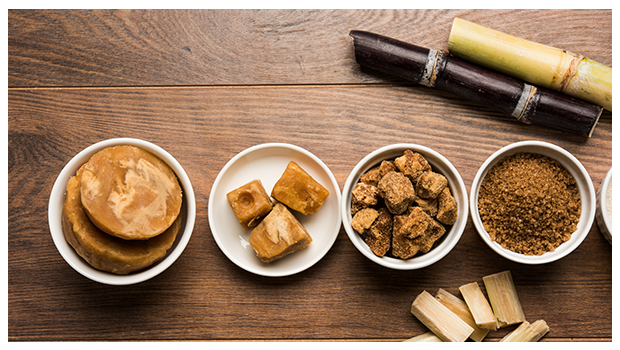 Commonly known as Karupatti in many regions of south India, palm jaggery is a perfect substitute for refined sugar. It has all the richness of a natural sweetener and none of the shortcomings of its processed alternatives. Here are the top five health benefits. A rich source of iron and several other nutrients like magnesium, potassium, and calcium, palm jaggery is not your usual cup of sucrose. It’s a perfect sweetener devoid of any artificial substances and full of natural nutrients. It has been observed that regular consumption of Palm Jaggery positively impacts digestive health. By activating digestive enzymes, the sweetener helps with regular bowel movement and cleanses the system. Among many other ailments that palm jaggery helps relieve, cold and cough is the most common one. Added to a warm cup of tea or water, it helps clear the respiratory tract and relieve several symptoms. Full of composite carbohydrates (as opposed to that in white sugar), palm jaggery is easier to digest. After eating palm jaggery, you can stay energetic for hours. Potassium is the nutrient responsible for the weight loss properties of palm jaggery. It helps reduce bloating and water retention, which in turn helps regulate weight. So, are you ready to try out this amazing natural sweetener? Give us a shout out and share your experience with us if you love this amazing natural sweetener.